All American History by Bright Ideas Press curriculum is always discounted at Schoolhouse Publishing! 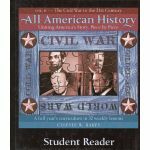 All American History is a comfortable and complete year's curriculum from Bright Ideas Press for students in grades 5-12 - another great multi-level product. There are 32 weekly lessons, and each lesson contains three sections examining the atmosphere in which the event occurred, the event itself, and the impact this event had on the future of America. The student activity book is full of maps, timelines, flag studies, review worksheets and more - all to complement your homeschooled student's studies in the All American History Reader. Support materials include a student reader and a teacher's guide (sold separately or in our 3-piece special). What I like: There's so much to like! The consumeable book (you'll need one for each student) has everything you need to complete the study, including all the timeline images, maps, flags, etc. You'll also find activities for further study for older students if you want to adapt it upward (as I am). This is what will help to bring the reader alive. It's even 3-hole-punched for inclusion in your student's portfolio! What I don't like: Most of the activities are a bit repetitious - with little variety from lesson to lesson. However, the activities are so worthwhile, I think students will find the familiarity comforting. They'll know exactly what's expected from lesson to lesson. This so-called weakness is more than compensated for by the great additional activities in the teacher's guide. All American History by Bright Ideas Press is complete and easy to use. Though not exactly like a textbook curriculum, if you are more comfortable with a standard textbook approach to education, this is for you. When I used it for my 11th grader, I was thrilled with how much he learned and how easy it was to implement (definitely self-directed). A good, solid curriculum that you'll be comfortable returning to again and again. Click here for a handy, printable chart that compares All American History with other homeschool history curriculum.